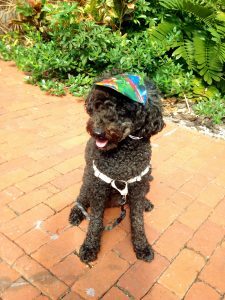 I’m Layla Troy a 7 year old Australian Labradoodle. I’m the official greeter at Island Outfitters. While I’ve only been here 7 years Island Outfitters has been going strong for over 14 years. This year we newly remodeled our shop and have lots of new lines to offer our customers like Simms, Howler Brothers and Fish Hippie to name a few. Our latest adventures are Sailing trips on the Apalachicola river. We can customize a 2 – 5 hour trip just give us a call. I love kayaking – especially in the Hobie Pro Angler and I always wear my PFD when on the water. 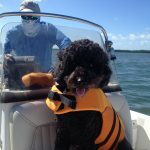 We have PFD’s for dogs and their humans as well. We just got in a lot of stylish Costa sunglasses – I think I look pretty cool wearing them. We have lots to choose from perfect for on the water on everyday wear. Stop by the shop – we are pet friendly of course.